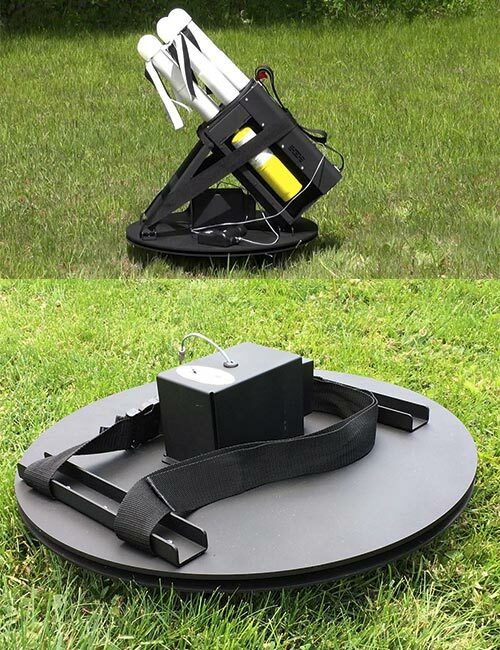 Rotating base will shoot 360 degrees wherever you decide. Runs off same receiver as launcher using opposite side. Legs fold for easy transport. Strap doubles as carrying handle and launcher stabilizer. Folding legs for easy transport and use on semi-level terrain. Fits all launchers from the two shot, five shot and 10 shot. Rotating base will shoot 360 degrees wherever you decide. Runs off same receiver as launcher using opposite side.Legs fold for easy transport. Strap doubles as carrying handle and launcher stabilizer. Folding legs for easy transport and use on semi-level terrain. $549 + shipping. Fits all launchers from the two shot, five shot and 10 shot.